Several years ago, back before I started this blog, I used to work at a small software company in Seattle. When I first started there it was a definitely a startup environment: we worked a lot of long hours and didn't have a lot of money to spend on morale events. However, that changed when I volunteered to make a surprise cake for one of my coworkers on their birthday. Everyone liked it so much, I found myself volunteering to bake every time I had the opportunity. As the company grew, I baked more and more, sometimes baking as many as three desserts an evening. There was one dessert in particular though that I made that made me think that I might have a knack for baking: Baumkuchen (translated as "tree cake"). This cake was requested by my friend Sean who had just moved back to Seattle after many years of living in Japan. He explained how popular a treat they are there and how much he loved it. Traditionally, the Japanese version is baked on a spit so that then the cake is cut, it resembles the rings that are found on the inside of a tree. I did a bit of research and found a traditional German version of the cake, which is baked in a traditional cake pan and under a broiler. From start to finish, this cake takes several hours to prepare and make. I think the first time I made it I literally used very bowl I had in the house! But when it was done, it was really something to be proud of. Although it wasn't the Japanese treat that he had come to love, he enjoyed the German version too. So much so that three years later when I asked him what I could bring to his annual holiday party, he asked that I make it again. Yield: Because the cake is so rich, this cake can feed a lot of people. Between the two cakes, you can easily feed 12-16 people. Grease and flour two 8x2 or 9x2-inch pans; set aside. Finely grind almonds using a food processor and set aside. Pour all the preserves into a saucepan and slowly warm the preserves on low heat. You'll know it's ready when the preserves loosen an stir easily. Remove from the heat and pour the preserves through a sieve, discarding any pulp. Remove 3/4 cup of the preserves into a small bowl and set both bowls aside. 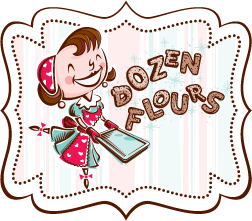 Combine the cake flour and cornstarch and sift twice. Set aside. Crumble the almond paste into bowl of a stand mixer and run the mixer with the paddle attachment for about a minute to warm it. Gradually add cream or milk, beating at low speed with electric mixer till smooth - about a minute. 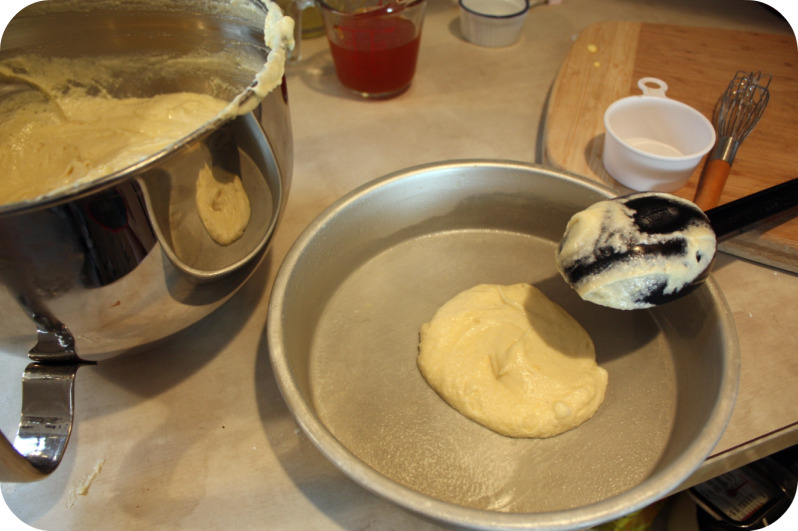 Transfer the almond paste mixture to a large mixing bowl and set aside. 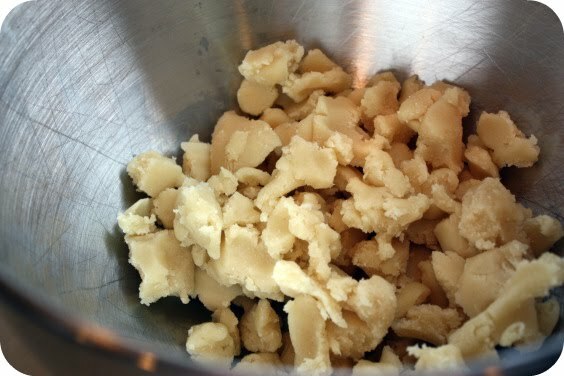 In same small bowl you used to mix the almond paste, beat the butter for two minutes on medium speed until fluffy. Add the rum, lemon zest, and vanilla and mix for another 30 seconds being sure to scrape the bowl at least once. Remove the bowl from the base of the stand mixture and very gently stir in the flour and cornstarch mixture just until combined. Stir the butter/flour mixture into the almond paste mixture until it's well combined. Using the same bowl, beat the egg yolks and 1/2 cup sugar on medium speed for 6 to 8 minutes or until it becomes thick and light yellow colored. Fold the eggs into almond paste mixture. In a large, clean mixing bowl, whisk the egg whites and a dash of salt on the highest speed until soft peaks form. 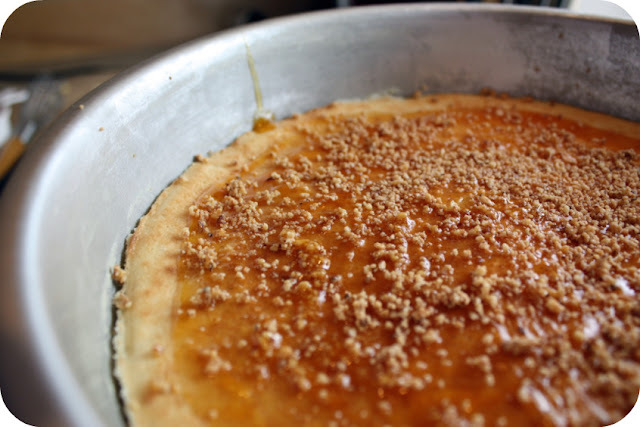 Gradually add the remaining sugar, about 1 tablespoon at a time, beating to peaks are stiff. 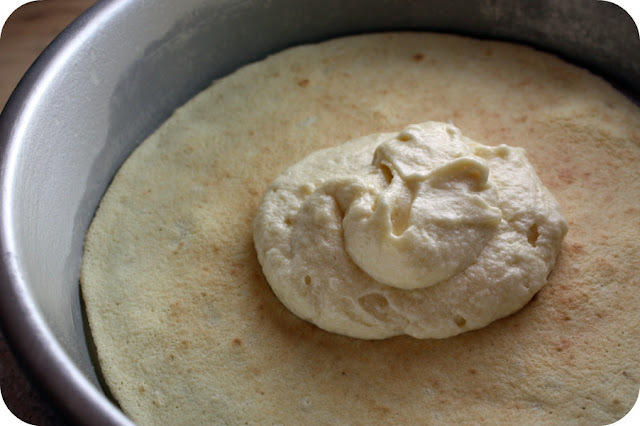 Gently fold the whipped egg whites into almond paste mixture until no large clumps of egg white or almond paste exist. Adjust oven rack so that the bottom of the pans will be about 5 to 6 inches from broiler. Carefully spread about 1/2 cup of the batter in a very thin layer over the bottom of the prepared pan. 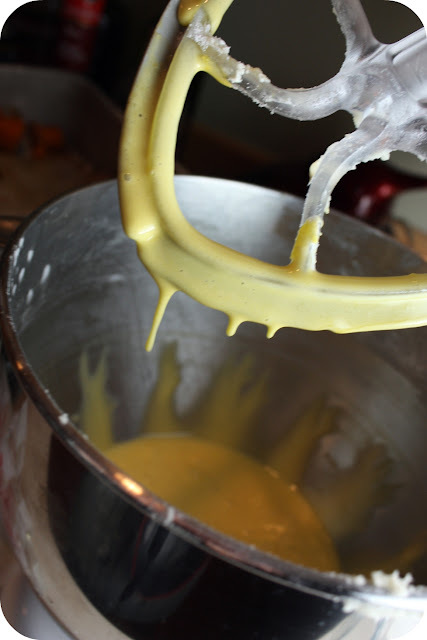 To make this easier, use the bottom of a small metal ladle, pushing from the center of the cake pan to the edge, being sure to cover the entire surface of the pan with the batter. Before you start baking, bring a pen or pencil and something to write on and place it near the oven. Then, bring a kitchen chair into the kitchen and set it up so it's directly in front of the oven. You're going to be spending a bit of time here and having a seat makes life a lot easier, believe me! Turn the broiler on and when it's fully heated, set a timer for 2:05 -- you should only need to bake the first several layers for 2 minutes each but the 5 seconds gives you a little count-down to putting the cakes into the oven, ensuring they get their every second of their two minutes. Slide the cake pan into the oven, keeping the door open. Broil for about 2 minutes or till deep golden brown and batter is set. Do not walk away from the oven or take your eyes off the cake. Seriously, don't be tempted to multi-task! Watch the cake carefully and turn it half way after about a minute or so ensure each layer is baked evenly. When it's nice and golden, remove the pan from the oven. Spread another 1/2 cup batter and repeat the process. Don't close the oven in between layers because it gets too hot and will effect your cook time. Make one mark on your paper to represent one layer. Make a mark on the paper after each layer to help you keep track of where you are in the process. After every two layers of cake, generously pour 2 tablespoons of warmed apricot preserves from the larger bowl on top of the broiled batter to about 1/2 inch from edge. 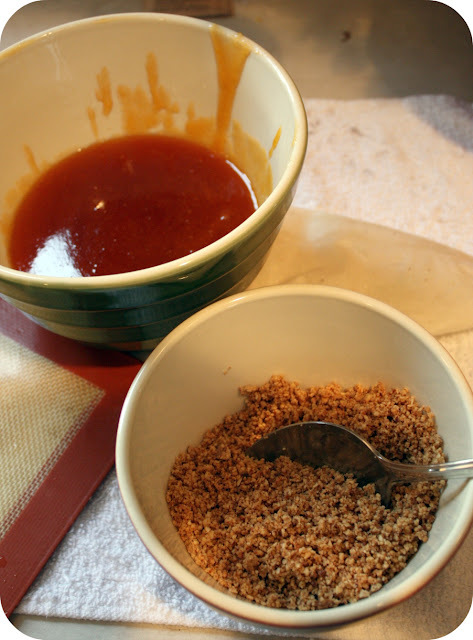 Sprinkle the preserves with about 1 tablespoon of the ground almonds. Then carefully spread another 1/2 cup batter evenly over nut layer, pushing the batter all the way to the sides of the pan. Broil until golden brown, top with another 1/2 cup of batter and repeat process until you reach the top of the pan. Try to end with at least one batter layer. Note: Keep in mind that the crepes will cook faster the more you add to the pan because they are that much closer to the heat. When you get to the top of the pan, turn off the broiler, and cool the cakes completely in the pans on wire rack. When cooled, loosen and remove sides of pan using a knife. Repeat the process with the second cake pan. Remove the cake and place on a cake board or small plate and continue to cool on a cooling rack. Place the cooling rack over the sink or over a pan. In small saucepan bring remaining glaze to boiling boil gently for 3 to 5 minutes or till reduced by about one-third. 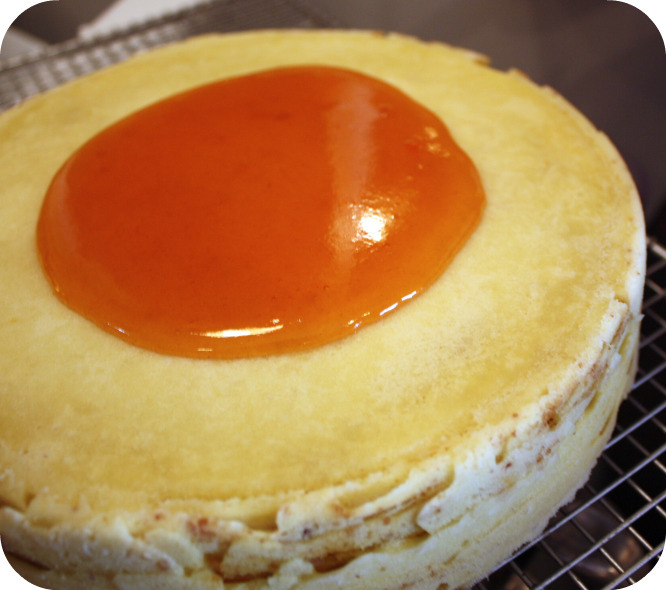 Spread Apricot Glaze over top of tortes, allowing it to drizzle down sides of the cake. Make sure every part of the cake is covered with the preserves. Chill for at least an hour. When the cake has 10 minutes left to chill, prepare the chocolate glaze: In small heavy saucepan over low heat, melt together butter and chocolate, stirring constantly. Remove from heat; stir in corn syrup and rum till smooth. Add a little edible glitter to the mixture (I use a toothpick to flick a few blobs of glitter into the chocolate. Be careful not to add too much glitter. Let the mixture thicken slightly for about 10 minutes. Remove the cake from the refrigerator and set it on top of a cooling rack over the sink or over a roasting pan. 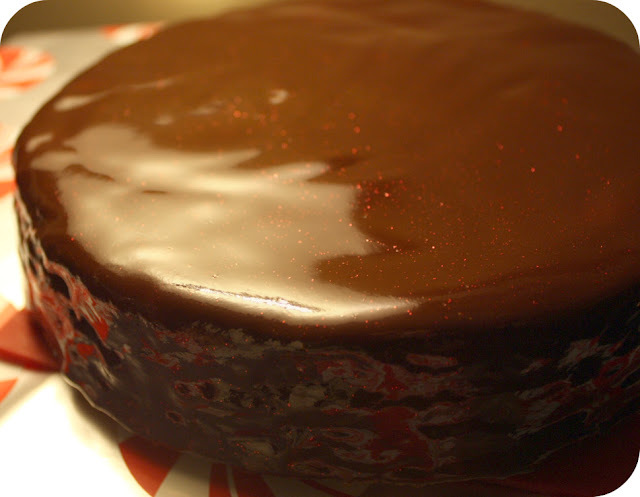 Slowly pour the chocolate over the cake, being sure to cover the sides of chilled torte. Try to avoid touching the glaze in any way. If desired, tortes may be prepared ahead and chilled; let stand at room temperature about 1 hour before slicing thinly to serve. Cut with a very sharp knife and be sure to wipe the knife after each slice. Would I Make This Again? This was my second time making it. I would make this again, although it's so special (and time consuming!) I think it may be a few years before I make it again. What a beautiful cake! Takes love to make that. I like your little note on grabbing paper and a chair to make ourselves comfortable while baking this. Yay!! Thanks so much, Julia! You'll have to come visit us in Japan and try the Japanese version! Now that's a glorious accomplishment! 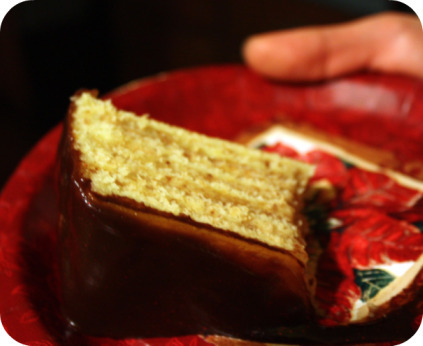 I've never made a baumkuchen, but was just reading about them the other day. Really a beautiful, beautiful dessert. Bravo! oh my!! that looks gorgeous and yummy! I'm impressed! I know it's not the easiest cake to bake, good job! Just found your blog today. I really like it. The king of cakes is beautiful. It seems you will have to have a free day to make it. It looks worth it though. I am baking a Starbuck's lemon pound cake and using some of your ideas! Sounds soooo good! Amazing job! My grandma used to make Kuchen when she visited over Christmas break, until she broke her hip and couldn't really move around the kitchen any more. She used her grandmother's recipe, which we still have written on the original recipe card, even though it's hardly legible. I just found your blog the other day, and this post makes me excited to see your future creations! One needs patience and dedication to make this cake,and you did a really good job with this one. what a great recipe...very well written and very thorough...it sounds like an incredible cake...I would love to try it!! At first I thought that this tree cake is just another term for the choco Christmas log I love. But boy was i in for a surprise. Although the process is tedious, I'm pretty sure this is gonna taste like heaven(I've never tried baumkuchen before). I just hope they sell something like this at some local cake specialty stores. your recipe seems especially complicated though... if your batter was thinner or spread out thinner you could have achieved more and thinner layers, just like in a tree. i know its annoying to have to take the cake out of the oven every 2 minutes like that but the result is worth it. believe me! ;) wish i could have a slice of that right now!